Indian Prime Minister Narendra Modi’s government’s liking for cows is no secret. Modi’s Bharatiya Janata Party (BJP) and its Hindu nationalist allies have turned bovine protection into one of the most important topics of public discourse in the country over the past couple of years. Cow vigilantes and right-wing Hindutva groups have also grabbed attention now and then with their vicious attacks on people suspected of mistreating cattle. In this context, it is not surprising that Finance Minister Arun Jaitley’s move in the annual budget to set aside millions to come up with ID numbers for the nation’s cows proved controversial. The government plans to spend about 500 million rupees (around €6.26 million, $7.81 million) to assign 40 million cattle a unique 12-digit identity number, in the same way it has come up with a unique ID for every individual as part of the nation’s ambitious identity card scheme, called Aadhaar. The reasons given to justify the project are multifold: to keep track of the nation’s cattle; protect them from smuggling gangs; help in taking care of abandoned animals and management of cow shelters, among others. “We want to improve breeding and milk production, and double the industry’s income by 2022,” said an agricultural ministry official working on the National Mission on Bovine Productivity scheme. Even before the fresh outlay of funds for the scheme, several states ruled by the BJP had already begun tagging cows. In the eastern state of Jharkhand, for instance, 12,000 cows have been tagged, of the province’s total 4.2 million cattle. It is one of the few states in the country where the Prevention of Cow Slaughter Act enacted in 2005 is in place. Those found guilty of violating the law may face a hefty financial penalty or imprisonment of up to five years, or even both. This enthusiasm is not shared by the government’s critics, who suspect the initiative could be misused to target minority and underprivileged communities under the pretext of cow protection. “This is finally going to be a witch-hunt and there is bound to be more targeted violence against minorities in the country in the years to come,” said Rasheed Khan, a dairy farmer in Delhi. “There has been a string of cow-related violence against Muslims in the country. Bands of right-wing Hindus who seize the cows are operating essentially as private militias and that should be stopped,” D Raja of the Communist Party of India told DW. In many countries across Europe, cattle tagging helps in tracing of animals for veterinary purposes, which is of crucial importance for the control of infectious diseases such as the mad cow disease. These so-called “unique ID numbers” are actually relatively old. Several decades ago, when the Eastern Bloc countries applied for EU membership, they were surveyed by the European Commission. Livestock, for example, was identified with uniquely numbered tags permanently attached to the cow’s ear. But there is more to it than meets the eye: in ever-increasing numbers, people the world over are turning to veganism, which means no meat or animal products. While this may be recommended for health reasons, we as Christians follow the instruction of Scripture: “Whatsoever is sold in the shambles, that eat, asking no question for conscience sake: For the earth is the Lord’s, and the fullness thereof. If any of them that believe not bid you to a feast, and ye be disposed to go; whatsoever is set before you, eat, asking no question for conscience sake” (1 Corinthians 10:25-27). #2149 A Remarkable True Story of One Man’s Search for Truth. 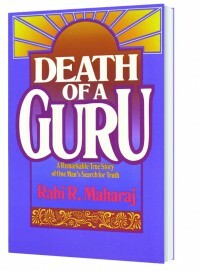 At a time when Eastern mysticism, religion, and philosophy fascinate many in the West, Maharaj offers fresh and important insights from the perspective of his own experience.